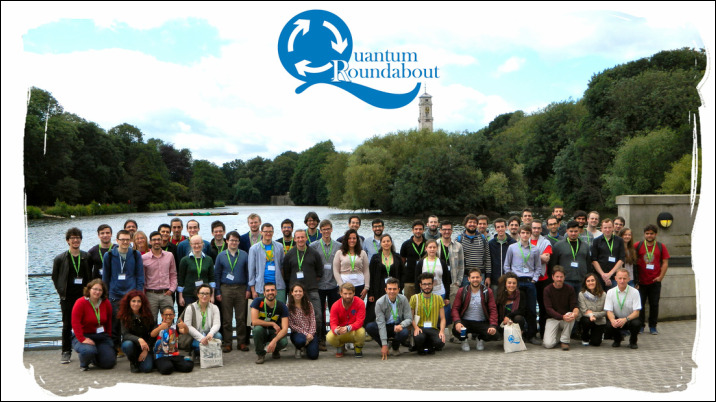 Thank you to all who attended Quantum Roundabout 2016! Quantum Roundabout is a postgraduate conference on quantum physics, which was held between the 6th and 8th of July of 2016 at the School of Mathematical Sciences of The University of Nottingham. This event brought together early career researchers, working at the crossroads between physics and applied mathematics, providing them with the opportunity to network and interact with their peers in related areas, as well as recognised experts. The conference is open to young researchers from universities all over the UK and overseas, and it is aimed to cover the mathematical foundations of three active research areas of quantum physics, all intimately interconnected, namely: Quantum Entanglement, Open Quantum Systems and Quantum Metrology. Three leading researchers in these fields have been invited to give lectures/tutorials on cutting-edge topics. Moreover, a flexible programme with room for up to 24 short talks and a dedicated poster session has been devised to encourage an active contribution from all participants. Prizes for the best student talk as well as the best poster will be awarded. with support from Gerardo Adesso, Katie Gill and the Quantum Correlations group at the University of Nottingham.